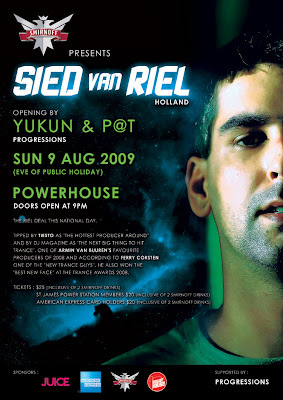 Tipped by Tiesto as "the hottest producer around" and by DJ magazine as "the next big thing to hit Trance", one of Armin van Buuren's favourite producers of 2008 and according to Ferry Corsten, one of the "new Trance guys". He also won the "best new face" at the Trance Awards 2008. Catch the debut appearance of this shiny bright star at this exclusive event. For table reservations, please call (65) 6270 7676. ONLY to the members of the PROGRESSIONS Facebook group and mailing list. On a first come, first serve basis; you and a friend can be our LIMITED guestlist (waiver of cover). Please email your FULL NAME (as in your ID) as well as the FULL NAME of your friend to progressions@asia.com by 31st July. We will revert with confirmation. We've got a huge one coming up this National Day. Instead of our traditional "anthems & classics" trance night, we'll be taking things a notch higher for our true blue trance fans! DJ Magazine as tipped him as “the next big thing to hit trance”. One of Armin van Buuren’s favourite producers of 2008 and according to Ferry Corsten one of THE new Trance Guys. He won the “best new face” Award at the Trance Awards 2008 @ MOS in London and has spun across the globe on events such as Trance Energy, Gatecrasher and Godskitchen. Details will be out soon so watch your emails and in boxes for invites to be on the limited guestlist. For the uninitiated, you can download our latest podcast which contains THREE of Sied's productions.